Ask fellow campers about "Grandview Inn-Motel and RV Park" and nearby attractions. Nice little campground. No over the air TV. Could not get Direct TV, but they do have cable included in the price. Verizon worked OK there. We camped at Grandview Inn-Motel and RV Park in a Motorhome. We stopped here after traveling throughout Western Washington then British Columbia and Alberta. This was a "way stop" on our way home. It turned out to be one of the nicest parks we have been in. Lots of shade trees and green grass. Clean facilities and helpful staff. We would definitely stay here again. We camped at Grandview Inn-Motel and RV Park in a Fifth Wheel. Both an RV park and a motel. Stayed here three separate times and found it very satisfactory. Other than the traffic noise, it's a quiet park and most sites are large, level, shady and all are full hookups with cable TV and usable Wifi. The owners are very nice and manage the park well. Did not use the restrooms. Used the laundry once and it was functional but not terribly clean. There was a lot of fire activity here this month and the owners were very accommodating to people who were evacuated from their homes and to firefighters. Will definitely stay here again. We camped at Grandview Inn-Motel and RV Park in a Motorhome. Harvest Market is a mid-sized grocery store just a mile or so east of the park and further east in Colville is a larger supermarket, Super 1, and also a SuperWalmart, fast food restaurants and many other stores. Ok for an overnight or two. Dirt/gravel road behind the motel but there are nice grass areas between sites and behind them. Mostly long-term residents with older rigs but everyone was friendly. One even gave us about a pound of salmon that he had just caught that day! Can't beat that. Only two washers and dryers but that was ok because no one else was trying to use them when we were. We camped at Grandview Inn-Motel and RV Park in a Motorhome. 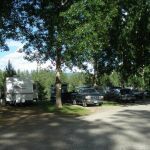 Easy check-in, under new ownership, very nice little park behind the motel, most sites are reasonably level, lots of shade with large grassy area, minimal road noise at night, several long term residents but they were very friendly, washrooms and showers were older but clean. Good WiFi and cable TV. Did charge extra for small children? Nice place to stay to explore the area. We would stay there again. GS Park. We camped at Grandview Inn-Motel and RV Park in a Fifth Wheel. Nice park, plenty of shade in lot 23. Nicely graded and very clean. Some road noise, but nothing that kept us up at night. A few long term residents, however there was no loud noise or rowdy behavior at all while we were there for the three nights. A nice touch - the groundskeeper delayed cutting the grass around our coach till we pulled out (without any prompting from us)! If you're heading this way, fill up on fuel before you get here. Apparently fuel has been quite expensive here for some time and it was no different during out stay. Would stay here again. We camped at Grandview Inn-Motel and RV Park in a Motorhome. 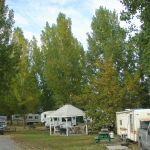 Attractive RV sites are tucked away behind a small motel framed by forested hills and valleys. The friendly owners keep the property well groomed. Level gravel pads are separated by grassy areas and mature trees abound. Utilities were reliable and include both Wi-Fi and cable TV. We would be very happy to return to this park. The rate reflects a Good Sam discount. We camped at Grandview Inn-Motel and RV Park in a Fifth Wheel. Very nice small park; would stay again. Internet pretty good Lots of space between RVs. Very park like setting. They are making a real attempt to please. We camped at Grandview Inn-Motel and RV Park in a Motorhome. For what we needed this was a great park: beautiful setting, level sites, large shade trees, full hookups and bullet proof Wi-Fi. This is a small park tucked in behind a motel building. There is some noise from the highway out front but it's not terrible and mostly no traffic at night. The Kettle Falls/Columbia River area has lots to explore and we had a tough time finding a spot like this. There are tons of Forest Service campgrounds but they have no hookups and are limited to smaller RV's. We're glad we found this spot and will be back. We camped at Grandview Inn-Motel and RV Park in a Fifth Wheel. This is a hidden treasure outside of Kettle Falls, WA. It is clean, shady, friendly and easy to find. The only drawback is there is only one women's and one men restroom for the entire park so you use your own or wait your turn. We have stayed here on two separate occasions and were grateful to get here both times. Wi-Fi is slow but that is a small inconvenience. We camped at Grandview Inn-Motel and RV Park in a Travel Trailer. 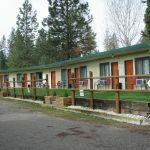 Are you affiliated with Grandview Inn-Motel and RV Park ?